Lately I have been posting very less and thanks to all the lovely people who have wrote to esquire about it. There definitely are some issues, which I need to resolve before I get myself back on this blogging track. 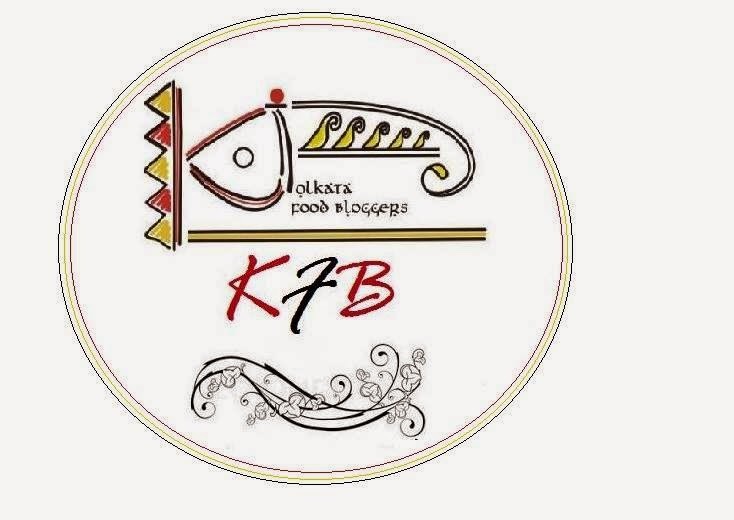 When I started blogging I loved to believe that I cook all authentic Bengali recipes, but with time that notion has changed. Now I know there is no stamp of authenticity. Depending on families, depending on region, recipes get changed. Though the basic framework remains same but some like it with more sugar and some like it with less spices. So when a reader said we should not use turmeric while cooking posto or someone pointed out no whole red chilly in Shukto…I replied and posted it all. I have nothing to hide and this dedication to our own cuisine actually makes me happy. But if you question about my commitment here then please hold on. I have something to say. Blogging like any other social media is a make believe world…you cannot judge a person from it. I can show only that side of my life that I would like to portray. Not that everyone does that but my point is if we want we can do that. Therefore it might be difficult to judge me as a person too but I believe 5 years of blogging should at least have earned me this credibility that am committed to this space of mine. Not because this is public profile or I earn from it but because this is a place I created for myself. To enjoy doing what I like. I as a person truly believe at least to be true to myself…in no way at the end of the day I should be able to question any of my act. So trust me here. in no way I bring half cooked or not cooked food to this table and in no way this is a mean for me to earn money or publicity. So if you think I am lying about a recipe or want to publicize my blog, then you might consider staying away. All said and done let me also add that when I started I hardly had any idea what I am getting myself into. It’s been a steep learning curve. 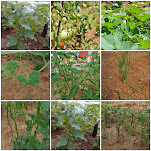 The knowledge abut food, cuisine, various techniques have made me rich as a person,,but the best part is the friends I have made here, friends so close that not a single day goes by without talking to them, friends so close that not a single thing gets unnoticed…I cherish this space of mine and cherish the love and affection we share through food. Again if by any means this post hurts your sentiment, I am truly sorry. I value your support. your friendship and your comment. Please keep them coming but please try to make sure its constructive. After this strong message I should offer you some sweet dish, a dish straight from my childhood. Those dew soaked early evenings of the day before Bhaiphonta (bhaiduj), Maa and her sisters sitting around the wood burning stove in our grandfather's old house, preparing for a grand feast for all their cousin brothers. chitchatting and rolling a sweet smelling dough between their palms and stirring a big potful of cardamom scented syrup. 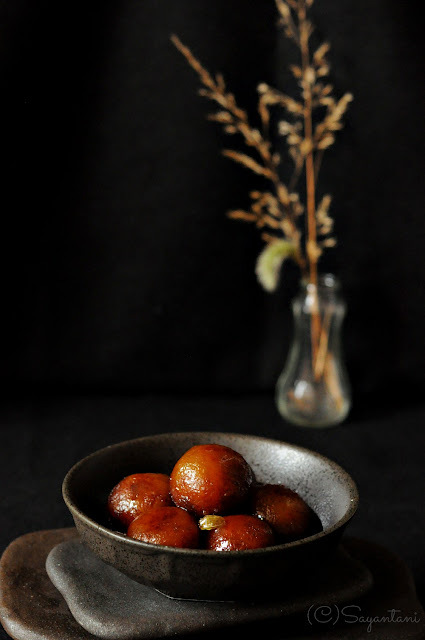 I dont remember what they talked about, but the scent of the bubbling syrup, the faint sound of that sweet little balls getting dropped in the pot is still afresh in my memory. Those days were soon gone with everyone getting married and leaving for their respective homes all over India but that memory got etched in a little girl's mind. who today not being so little anymore, tried to relive those memories by preparing this easy dessert in a far away land. Happy Holi friends. If you desire make this easy dessert with sweet potatoes, and woe your guests. Rub and wash the skin of the sweet potatoes to get rid of all the dirt. With a thin and pointy knife poke through the sweet potatoes at 3-4 places. place them in a pressure cooker and add 11/2 cups of water. tighten the lid and cook on medium for 1 whistles. let the steam dissipate in itself and then take out the potatoes one by one. you can also boil or steam then in a heavy bottom pan but at the end of cooking it should be soft so that you can mash them to a smooth dough. To make the dough first I mashed them with my hand and then press little bit of this through a medium sieve. you can just process it in a mixie as well. do this after you peel the skin. add the flour and knead to make a smooth dough. 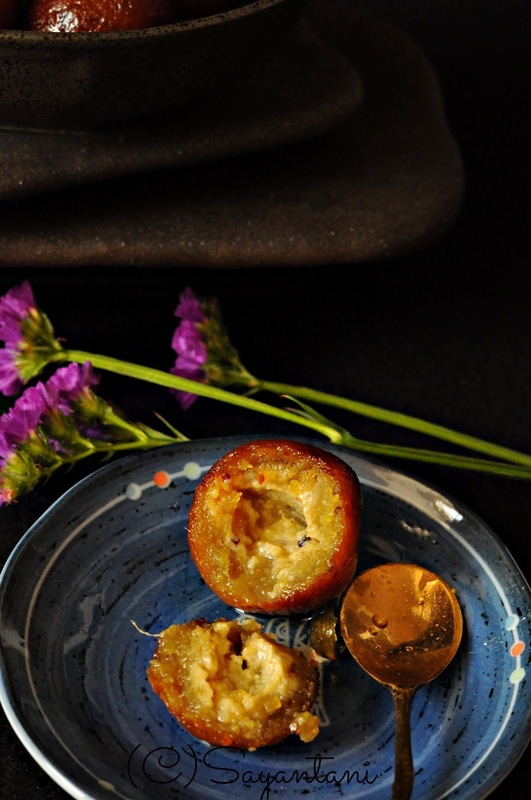 pinch small lemon size dough and place one cardamom seed and a pinch of khoya or milk powder paste in the middle. close it and tightly roll between your palm to smooth the surface. keep aside. Repeat with the rest of the dough. I got 2 dozens of pantua from the dough. in a heavy bottom pan bring the water and sugar to a boil. stir so that the sugar does not get burnt at the bottom. Once it comes to a boil pound and add 2 green cardamoms and let it simmer on medium flame till its thick. once done it would be thick and sticky (almost 12-15 minutes). keep this warm. heat oil for deep frying in a heavy bottom pan. Once it's very hot carefully place the gulab jamuns in a single layer. do not over crowd the pan. once the colour starts to change lower the heat to medium and fry till they are dark brown in colour. with a slotted spatula take them out one by one and dunk directly to the warm thick syrup. let them get soaked at-least for 20-30 minutes to absorb the aroma and get super soft and pillowy. While mashing the boiled sweet potatoes make sure that its really smooth and while shaping try to roll it tightly between your palm. the surface should be smooth for a nice and evenly colored finished product. If you eat them immediately you might notice the sweet potato flavour. We prefer to rest it for 6-7 hours for the flavour to mature. With this heavenly sweet I wish you happy Holi! Wherever you are make sure to see and play with some colour. Love the way you have described it sayantani! !! I can visualise every word of it. Healthy treat!!!! Happy Holi to you!!! Sweet potatoes....that's something new . 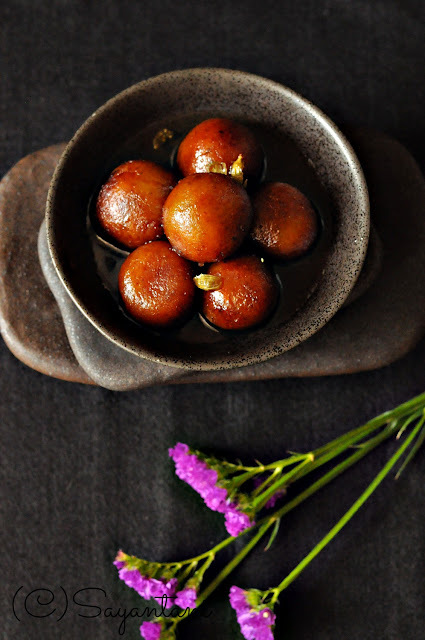 I have never tried jamun made from sweet potatoes...! love the pictures. As far as blogging is concerned, I think you are doing a great job ! 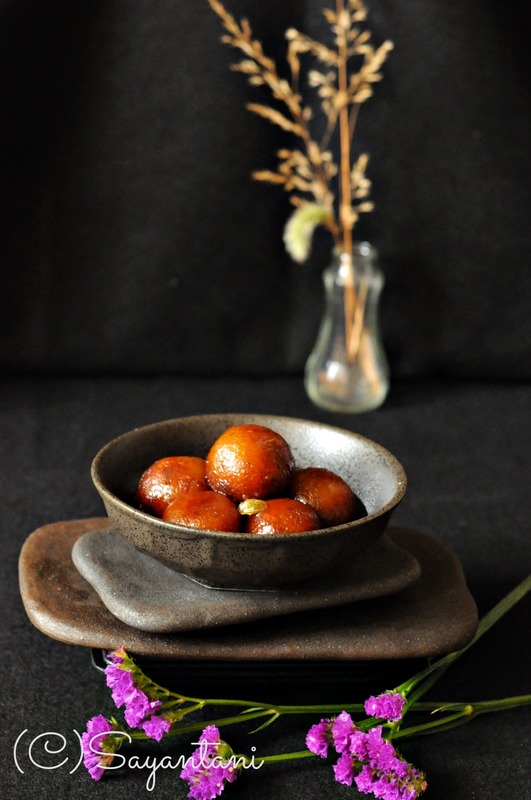 Omg, dont tortue me like this dear, cant take my eyes from those juicy jamuns, irresistible and love to finish that bowl. 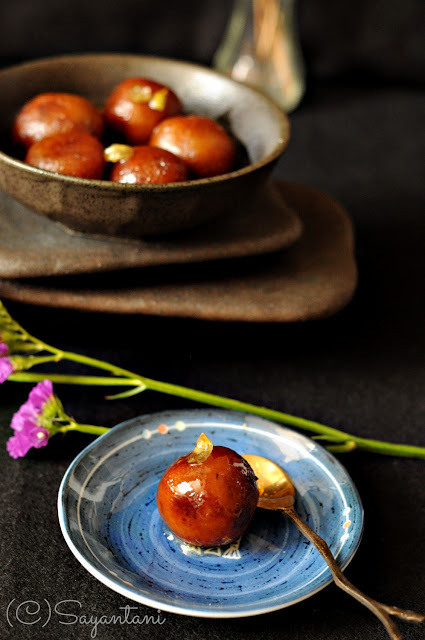 Happy holi wishes to u.
Gubal jamun with sweet potato ? First time I have heard of this, sounds like a fun idea ! Happy Holi to you. And I absolutely love the photography ! I love ur recipes especially the chilli pickle ! Your words are poignant, blogging is something we all cherish! 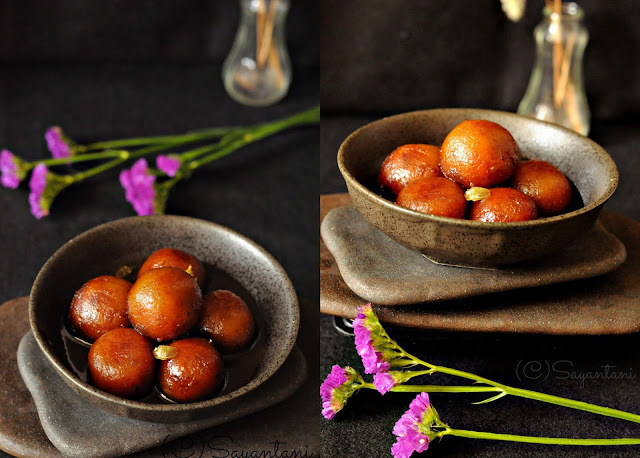 I ve heard of this sweet potato jamun looks delicious ur pictures! these look so yummy....i had made these long time back....your pictures are making me want some right now!! Missed you in blogging dear :) been busy too sorry I did not send a mail to check, will send one today to update things :) lovely sweet :) and awesome clicks too. The only way I eat sweet potato is boil and dunk them in tamarind chutney!! I am so in awe with this amazing dish...surely trying this very soon. Thanks for sharing such versatile and traditional recipes and yes we need to see so much more of you. Hi! Your blog is awesome and the dishes look really yummy! I actually wanted an advice from you. What should be added to the icing cream of cakes so that the icing becomes nice and stiff and is easy to pipe out of the piping bag..awaiting your reply. dear sayantani, knowingly or unknowingly, you have become the sister whom i never had. so dont let any comment dishearten you. never justify your actions. if it makes you happy and you are not crossing any lines, then go on, blog away. happy holi. i agree with what you say about blogging. i had made gulab jamun with sweet potatoes and they become a bit dense. a perfect vegan treat if khoya is substituted with almond paste or almond meal. Thanks everybody for everything espcially the moral support. I badly needed this. Nandita and Prerna, when it comes to express my feelings am really bad with words. I wont thank you as it wont be enough for what you have said. but am really glad to have started blogging and showered with love and affection from you people. I value this unconditional support the most. love to both of you. This recipe is worth bookmarking, love the new pictures you have been taking.. Came out really well. had their sale less than a week later http://hautelookzone. Seriously, I am a chef from Orlando, Florida and I am Brazilian and Puerto Rican. 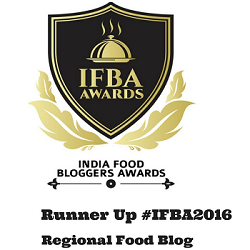 God has put in me the passion to be on fire for Indian and its cuisine and your blog is one of the windows I have for the cuisine of the Bengali region. I appreciate so much all that you do and I want you to know that. Also if you could specify which recipes are traditional in Bengali cuisine when you make them or Ill ask you I would really appreciate it. You are great really, thank you so much. Thank you for this recipe one of my bhabi made this many years back and after all these years I wanted to make it. Could you please upload few photos of the steps when you post a recipe, in this case the colour while deep frying would be very helpful. I am a Bengali and I sadly don't know much about Bengali cuisine as I was brought up in Gujarat. I am married and a mom now, and feel the need to get back to my roots. Ur blog helps me a lot. I shall make the ranga alur pantua tonight. Thank you so much.